Order of the Red Banner of the Soviet Union. This is a 1950's era example, showing a flawless enamelled solid silver base, measuring 40mm high. The laurelled wreath shows a good age patina overall, with red/orange enamelled CCCP standard and central red star with hammer and sickle. Large red banner, again shows perfect enamel with no fading to lettering. 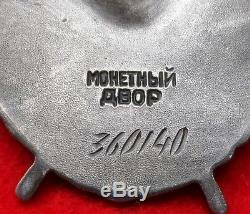 Rear scalloped portion shows Leningrad Mint marked and numbered 360140. Comes with the ribbon wrapped mounting bracket as awarded. This was the first Soviet order. Awarded to military personnel of the Soviet Army and Navy who display exceptional courage, self-denial, and valour during combat. The Order of the Red Banner originally appeared in 1918, as the Order of the Red Banner of the Russian Federation. The award was offered to citizens of the Republic for exceptional military service. 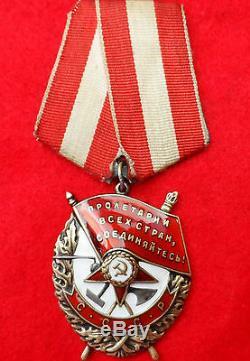 Other Soviet Republics followed Russia and issued their own version of the award. Azerbaijan was the first with the Order of the Red Banner of the Azerbaijan SSR. 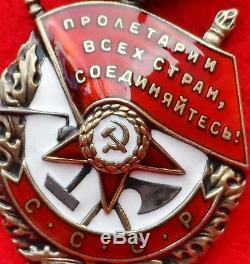 After the formation of the Union of Soviet Socialist Republics in 1922, the country's all-union military decoration became the Order of the Red Banner. 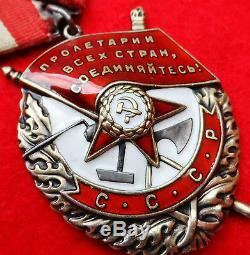 Earlier awards distributed by each of the Soviet Republics were allowed to be kept by their recipients. It was decided these awards had great historic significance as they were awarded during the Civil War, and served as reminders of heroic events. 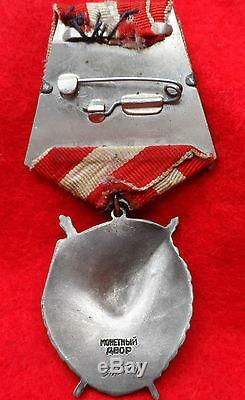 We list militaria and coins weekly. We provide quality mounted medals, badges and historical research. We can mount your miniature or full size medals, ribbon bars or supply replacement ribbons or badges. We can also conduct military research on your behalf and value cherished objects with a current market or insured value. 2/135 Russell St, Morley, WA. We run two specialist military auctions per year. Items are accurately described & photographed. Additional costs for this standard service will be added for this service based on publicly available Australia Post rates. Please note, these items are located and will be posted from Australia. We appreciate fair feedback from you once you receive the item. We aim to give you, the customer our best customer service. 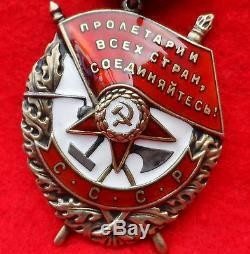 The item "VINTAGE POST WW2 RUSSIAN SOVIET UNION ORDER OF THE RED BANNER MEDAL FOR BRAVERY" is in sale since Friday, October 4, 2013.